“The bane of pain is plainly in the brain.” – Dr Allan Basbaum – Pain. Health. Exercise. Do you believe that people can sustain significant damage yet experience little or no pain? Taking from the example above, these wounded soldiers were not in the right frame of mind to be conquered by pain. Their lives, their country, what they were fighting for, were at stake. These people were neither worrying about their injury nor paying attention to them. The adrenalin in them was high. This anecdotal information leads to finding a solution for people suffering from non-cancer chronic pain. In non-cancer chronic pain, usually all dangerous painful medical conditions have been ruled out. The cause behind chronic pain is always unknown but recent evidence shows that treatment that targets specifically at the brain has a better chance at success. 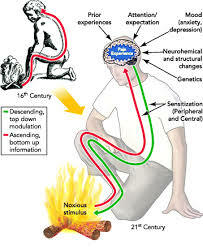 Why exercise-based treatment for a condition that clearly, is a problem with the perception of pain? People who suffer from persistent pain usually are more physically deconditioned compared to their counterparts who are not suffering from persistent pain. The main reason is that people who are in pain move and do less due to pain and the fear of re-injury. There is a strong urge to get these people active in the right way again! There is a huge body of evidence supporting physical exercise for the reduction of pain. In many occasions, the perception that ‘exercise worsens pain’ is a major barrier for these people to take up regular physical activity in their rehabilitation, most probably due to previous encounters with pain during exercise or an innate belief that exercise provokes injury/pain. These individuals will then require a cognitive-based interview session to break down these beliefs before exercise therapy can start successfully. Once the barriers towards exercise therapy has been broken down, we can fully concentrate on exercise-based physiotherapy. There are many mechanisms at work behind exercise in reducing physical pain and it is generally called ‘exercise-induced hypoalgesia’ or EIA. In layman terms, it has always been associated with ‘runners high’. However, you don’t necessarily need to run, be a runner or excel in running to get a ‘high’. I shall follow up a post on EIA in time to come. Indeed, the bane of pain is plainly in the brain. Previous Post Spondyloarthritis – Never heard of this before? Next Post Do you know your pain medications?